The PacSafe Coversafe S80 has innovative holster style design rests effortlessly on a woman's body and is large enough to fit an airline ticket, passport, cash and coins. The soft adjustable strap imitates a bra-strap so would-be thieves will be none the wiser to your concealed valuables underneath. Its Unique Fabric is exceptionally soft-to-the-touch and the Snap Button Flap Closure allows easy access to essentials, when you need them. Cross Body Circumference : 31.1" - 49.2"
The Pacsafe Coversafe S80-Orchid Pink has many exciting features for users of all types. 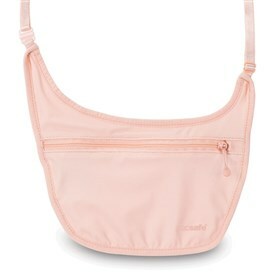 See the Pacsafe Coversafe S80-Orchid Pink gallery images above for more product views. The Pacsafe Coversafe S80-Orchid Pink is sold as a Brand New Unopened Item.